Last weekend, I went to a Gaudy at my alma mater, and lifted a glass of water for the Floreat Domus. * My university friends were surprised to see me off the sauce. But the truth is, I gave up drinking almost exactly a year ago, and haven’t found sobriety difficult. Why? No mystery – I just got fed up with the hangovers. I’ve noticed people often expect writers to be heavy drinkers – it’s all part of the mystique, or something. You may recall I’ve even described a writer’s life as ‘Pyjamas and gin’ on this very blog. My grandmother recently shared a picture on Facebook with the legend ‘Write sober, edit less’ – a variant on the line ‘Write drunk, edit sober’ frequently (mis)attributed to Ernest Hemingway. I’m not going to claim I’ve never written drunk. But Grandma’s pat little slogan holds within it a deeper truth: that chemical imbalances aren’t actually that helpful if you’re trying to get stuff done, and ‘stuff’ includes writing. There’s a whole mythology that substance abuse is some kind of muse, and if I wanted to I could pretend that time I washed down my prescription painkillers with gin and then wrote some trippy flash fiction made me part of an honourable tradition stretching back to the Romance poets with their laudanum and Hemingway with his rum cocktails. But that would be kind of pointless. Ultimately, writing is a job, and drink doesn’t help you to do it any more than it helps you to do any other job. 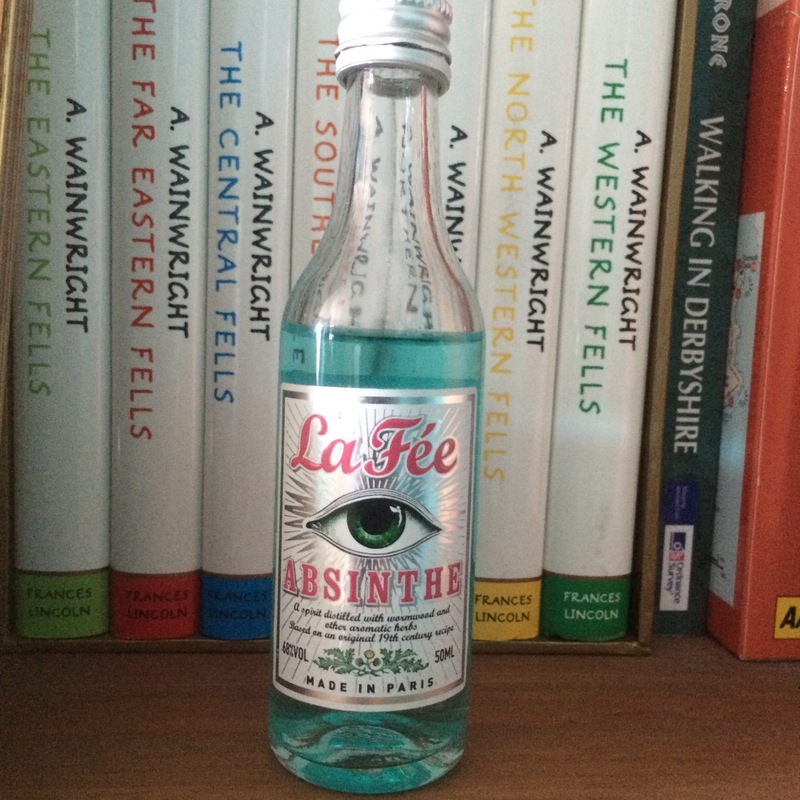 That said, I’m not getting rid of the absinthe just yet. Better safe than sorry. *translation: I went to a reunion at my old college, and lifted a glass of water for the toast. I’ve just had an intensive few weeks of work editing the final draft of my novel, The Silvergreen Sea. Now, I’ve finally finished, so I can put my feet up for a well-deserved break and catch up on sleep and television. Editing is a strange business. It’s basically nit-picking your own work, trying to be the most annoying possible reader – the type of reader who remembers exactly how long the journey between your two key locations takes, that the door you described as painted green on p.348 was described as red on p.12, and by the way shouldn’t you be using ‘sneaked’ rather than ‘snuck’ as the past tense of ‘sneak’ if you’re writing in formal UK English? When you’re editing, you’re trying to keep a sense of the overall pace and shape of the work, the consistency of characterisation and theme, to make sure it all hangs together as a coherent whole. You’re also trying to spot when you’ve accidentally typed an extra space before a full stop. These different elements can be difficult to do simultaneously, which is why I tend to alternate combing laboriously through each section with reading the whole thing as quickly as possible. There are other tricks as well, like changing the font or reading out of sequence, which can help spot errors. And they’re always there to spot. Time and again, I’ve looked at a passage I thought was just about perfect, only to realise that I’ve called a male character ‘she’, or I’ve sent my characters to sleep in one place and woken them up somewhere else, or some other ridiculous mistake. And infelicities of phrasing or over-used words are another issue. My particular nemesis this time round has been the word ‘look’. Such an unassuming little word. So useful. Several handy meanings. I used it 445 times in a manuscript 430 pages long. Only one thing is for certain when it comes to editing: you’re never done. Hence the sarcastic quotation marks around the word “final”. Oh sure, I can call it final now, but I’ve given the book to my husband to read, and he’ll doubtless find something wrong with it I’ll need to fix. Then I’ll send it to my agent, who’ll doubtless find something else wrong. As and when it finds a publisher, another editor will have further suggestions for improvement. I expect that if my dream comes true and I one day pick up a paperback copy from a table in Waterstone’s, the first thing to catch my eye will be a typo. Part of the art of editing is finding that balance between making it perfect, and acknowledging that it will, in fact, never quite be perfect . But hey, I’ve finished this “final” draft, so time for the champers!